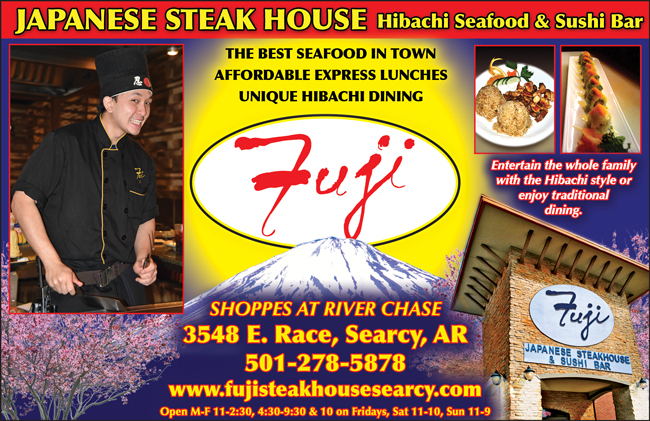 Taste the experience at Fuji Japanese Steakhouse Hibachi & Sushi Bar in Searcy Arkansas. Have you ever felt the warmth of an onion volcano? Have you heard a master chef in perfect rhythm? Have you ever tasted waves of flavor from specialty sauces or seen fried rice that shows plenty of heart? Have you ever taken in the full symphony of scents rising from a 500-degree grill? It's not just a meal, it's an experience. Ken Yang and the staff of the Fuji Japanese Steakhouse invite you to enjoy teppanyaki favorites like Hibachi Steak, Chicken and Shrimp, as well as seafood and sushi bar. They are located at 3548 East Race in the River Chase Shopping Center. Fuji is open seven days a week and has an extensive lunch menu served Monday through Saturday from 11:00 a.m. till 2:00 p.m. They are also available for special catering and parties. Come by today for a truly unique experience or you can reach them at (501) 278-5878 to order take out or for more information.